The debate about what motivates adolescents the most-food or music-is ongoing. This FREE Middle and High School ELA activity, "Sing, Sing a Story," focuses on food for students' minds,hearts and souls- Music. Students choose one of two projects to complete in pairs, and if need be,one trio. Lurking in the bushes, Mr. Fox watched all the boasting and smacked his lips. “Gimmie some fillet o’chicken; gimmie some now.” (7a) To Chanticleer he said, “Dawg, you’ve got some pipes. That was hot!” (7b). Then he pounced on the rooster. Note: the numbers in the parentheses are song/singer/lyricist/speaker citations. For Option 2: A Song Story, students-again in pairs and one trio, if uneven class numbers exist, summarize the whole story-or novel- and then create a song-story, like Bon Jovi's "Livin' on a Prayer,: Queen's "Bohemian Rhapsody,or Tracy Chapman's, "Fast Car".The story that the students spin must clearly, yet succinctly, show the whole story-its characters and conflict. How do teachers use this activity? They introduce the activity by reviewing the Introduction and the Directions on pages 3 and 4. After reading the directions for Option 1: A Lyrical Conversation, they ask students to offer suggestions of lyrics for characters’ words from the story. Then, after reading the directions for Option 2: A Song Story, they ask students to name a song-story, the artist and to summarize the story. For the teams, teachers either divide the students into pairs or allow them to choose their partners. If the class number is uneven, students may group into one trio for Option 2: A Song Story. Students should have time in class to work on this activity, such as 30 to 55 minutes, depending on their skills and abilities. To finish this activity, students may work in class the next day, and/or complete it as a homework assignment. Teachers select their desired option, depending on their students’ skills and abilities and their objective(s) for the activity. Teachers should set aside 2-3 days for the students to present their completed projects in front of the class. They will either pick the students to present each day, or randomly choose the first pair/trio on the due date, and then have those students select the pair/trio that will present next, and so on until all students have presented. After each pair/trio has shared their project, they must turn in their final packet consisting of the typed Final Draft, the activity worksheet (page 5 of this packet) and any other notes. 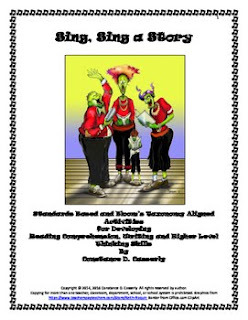 With "Sing, Sing a Story," students will be thrilled to keep tuned in to their music and turned on to showing their comprehension, writing and higher level thinking skills. Teachers will want to dance to the music of their students' learning. Writing Activities: Creating Drama - "Basic Stage Directions and Scripts"